I decided to give this thing called Me Made May a go. Basically it’s for people who sew, knit or crochet, and you make an effort in May to wear things you have hand-made as much as possible, and take photos of it. Some people try to do it every day, but I’m not up for that this time. I often find myself falling into the trap of thinking “Oh no! I shouldn’t wear that. It’s too nice. I’m not doing anything special today” and wearing the same boring outfits again and again, which is no fun. I don’t know what this imaginary special occasion I’m saving things for is, it’s not like I have a wardrobe of ballgowns. I made this dress about 6 years ago. 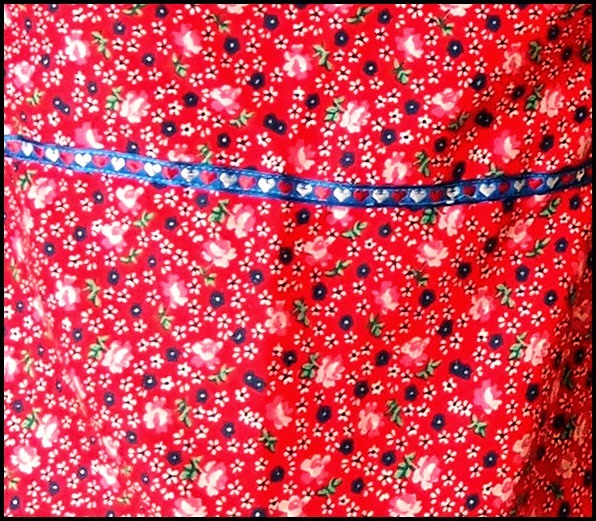 It’s a red fabric with white and blue flowers, and blue trim with white and red hearts. 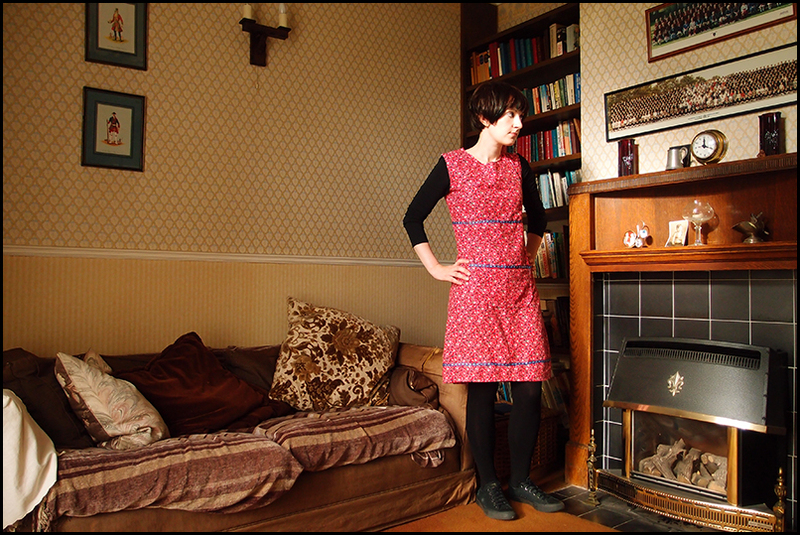 I don’t think I’ve ever worn it before (even though it has a big pocket on the front), because it seemed like a bit of a shapeless smock. I decided to give it a go today though, and it’s grown on me. I’ve got a whole host of things that need minor alterations or hemming, so that’ll give me impetus to finish and wear them. Here is a bad closeup of the fabric, cropped from a photo, as the print seems to confuse the macro setting on the camera. I went to visit my dad in Rochester earlier today, this photo is taken at his house. He has been suffering with some real health problems, but things seem to have got better recently, which is a big relief. This is not actually his living room. This is a sort of weird area of the hallway that serves as a sort of overspill extra living room. In the original house layout, it was the dining room (there is a hatch into the kitchen behind that book case). My parents extended the house and changed the layout, because the original bathroom and kitchen were really small, and there was a pointless outside toilet where there is now a patio. The dining room was combined with the living room, so this became a sort of spare area. My parents bought the house in the early 80s, and I think that carpet came with it. The brown carpet is indestructible. Other rooms without it have seen carpet come and go, worn out, but the brown carpet soldiers on all over the house. The people who owned it before were also really into painting things orange. Some rooms had orange ceilings. The outside of the house was also painted orange. My parents repainted it white, and apparently some of the neighbours moaned because they used to direct people like “I live 2 doors up from the orange house”. I have a picture of the house in its orange paint and extra outside toilet glory days somewhere in a scrapbook, but I’m not going to scan it now. My mum bought that sofa in the 70s from a hotel that was closing down. It’s a great sofa, but it’s been falling apart for as long as I’ve known it, and is too large to fit through most doors, which is why it’s out there (there’s a french window there, which is a very odd thing to have on the *front* of your house – I can’t recall it ever having been opened). You kind of sink if you sit in the middle. The gas fire is good in the winter. There is also a portable tv. I used to hang out here as a kid, playing on the megadrive and trying to do handstands while watching children’s tv. My success with the handstands varied. I got it down at one point, but then I had a growth spurt and it was back to the drawing board. I’m not sure if I can do them now. Maybe I should try when there is a reliable person to catch my legs. Sometimes I combine the two, and look like I don’t really understand what this photography business is, but I know it makes me angry. I was bedridden with some sort of 24 hour fever thing on Friday/Saturday so I also still had big dark circles under my eyes. This was the most flattering photo I managed to take . You can see me intently studying my sister’s school photo. There are some amazing 80s hairstyles in that picture. I particularly like the ginger punk girl. What we need is somebody reliable to take a picture the next time you try a hand stand. I'm just gonna put it out there….I'm a redneck (more accurately a Cracker) who loves tiny flowers. There you are then I said it. Primavera by Botticelli is either responsible for it or the revelation of it. I like anything with tiny flowers.